Local B2B marketers came together at an educational event hosted by SEI in Oaks, PA last Thursday to learn from a CMO of an investment company, a marketing agency president, and a NY Times best-selling author/ partner of a media company. The topic? A B2B marketer’s new job – selling. The day concluded with a tour of SEI’s art collection, the West Collection. Howard Sherman, chair of the BMA Board of Advisors, shares his thoughts on the value of BMA membership. Here’s what eight BMA board members believe are the trends in B-to-B marketing that bear watching in 2016. 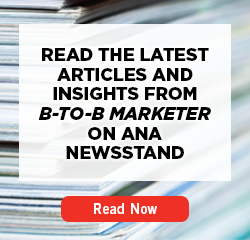 Explore best practices and B-to-B insights via our Content Library, with hundreds of content units, white papers, articles and case studies curated from ANA sources.